The artist, educator and advocate for indigenous communities will lecture, show his work and be inducted into Temple’s Gallery of Success on October 17-18. Edgar Heap of Birds—Cheyenne-Arapaho artist, educator, advocate for indigenous communities and distinguished alumnus of Temple University’s Tyler School of Art—is returning to Tyler for a public lecture, an exhibition of his work and his induction into Temple’s Gallery of Success on October 17-18, 2018. The celebration of Edgar Heap of Birds, MFA ‘79, begins on Wednesday, October 17, with a free public lecture, “Influences, Mentors, Colleagues and Our Homage to This Earth,” at Temple Contemporary, Tyler’s exhibitions and public programs space (6 p.m., 2001 N. 13th St., Philadelphia). The lecture is part of the Critical Dialogue series, a long-standing core component of Tyler’s MFA program in Painting, Drawing and Sculpture. 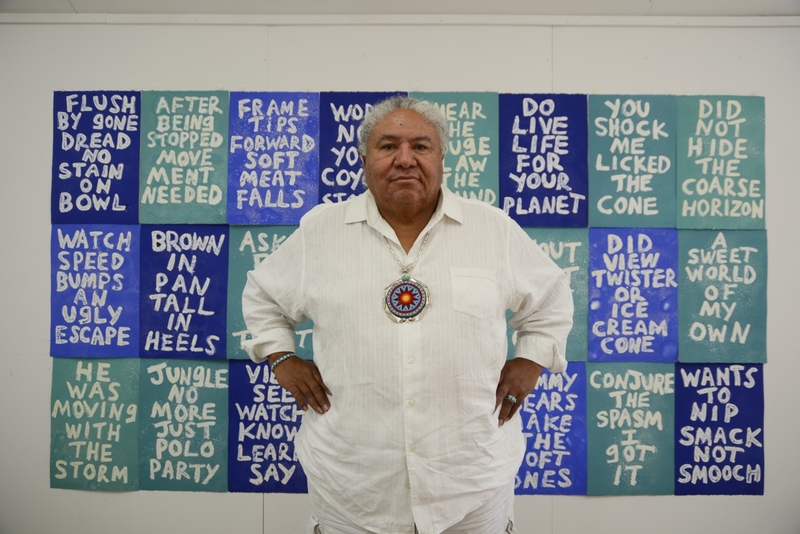 Temple Contemporary will display his powerful work, “Not Your Coyote Stories” (above, in background) until December 8. On October 18, Heap of Birds will be honored in a private Gallery of Success ceremony in historic Mitten Hall at Temple’s Main Campus. Now in its 21st year, the Gallery of Success is Temple’s annual celebration of the outstanding professional achievements of its alumni. Each year, one alumnus from each of Temple’s 17 schools and colleges is honored. Their portraits and biographies are put on display in Mitten Hall, where they serve as an inspiration to current students. In 2007, the Smithsonian Institution’s National Museum of the American Indian invited Heap of Birds to participate in the Venice Biennale. His “Most Serene Republics” project included installations throughout Venice honoring the warriors who were coerced into performing in Buffalo Bill’s Wild West show, particularly those who died while the show toured Europe. Heap of Birds’ work also has been exhibited at the Museum of Modern Art, Whitney Museum of American Art, the National Museum of the American Indian, the National Gallery of Canada, the Metropolitan Museum of Art, Museum of Contemporary Art Australia and documenta in Kassel, Germany. He has received grants and awards from the National Endowment for the Arts, the Rockefeller Foundation, the Louis Comfort Tiffany Foundation, the Wallace Foundation, the Bonfils-Stanton Foundation and the Pew Charitable Trusts. He was named a USA Ford Fellow in 2012. Currently professor emeritus in the Department of Native American Studies at the University of Oklahoma, Heap of Birds also has taught as a visiting professor at Yale University, the Rhode Island School of Design and the Michaelis School of Fine Art in South Africa. Before attending the Tyler School of Art, he earned a BFA degree from the University of Kansas in 1976 and attended the Royal College of Art in London.